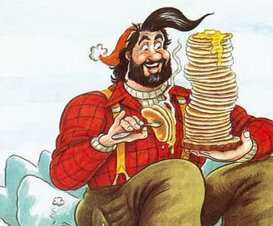 Big as a mountain and strong as a grizzly bear, Paul Bunyan was the greatest lumberjack to swagger through the North American forests. All the larger-than-life characters in Paul's supporting cast are here, including Babe the Blue Ox, eating her ton of grain a day, and Hotbiscuit Sally with her acre-and­a­half griddle. The outrageous adventures of this quintessential American hero represent the very best in the proud tradition of American storytelling.